May 11Check out the CFHS Tiger Times on Apple News! On January 26, senior Henry Woofter won the CVC Wrestling Tournament at West Geauga High School rounding out four opponents. Woofter competed four times throughout the day, pinning all of his opponents. “I pinned everyone in the first period, In fact, my finals match was only ten seconds long and I like to kind of get it over with as fast as possible,” Woofter said. When a competitor pins their opponent, they are holding their competitor flat on their back for more than one second. “I just wanted to take his head off. I’m a different person when I step out on the mat,” Woofter said. Head coach Peter Cimoroni and assistant coach Jake Goodwin have prepared Woofter very well all season long. “My coaches have been perfecting my positioning and technique and transitioning me from football shape to wrestling shape throughout the whole season,” Woofter said. Woofter has put in a lot of work this season and both coaches and fans can see the work show off in matches. “Henry goes right for the pin. He is aggressive and for a big man in great shape. He works hard in practice and leads his team in all aspects of dedication and tenacity,” Coach Cimoroni said. Woofter’s dedicated work ethic has led him to many wins this season. It has played a tremendous role in being a role model for his other teammates. Junior Alex Partain understands the impact Woofter has on Chagrin wrestling and how embodies being a role model. “He’s always being supportive, being the cool guy all while being a role model for us,” Partain said. 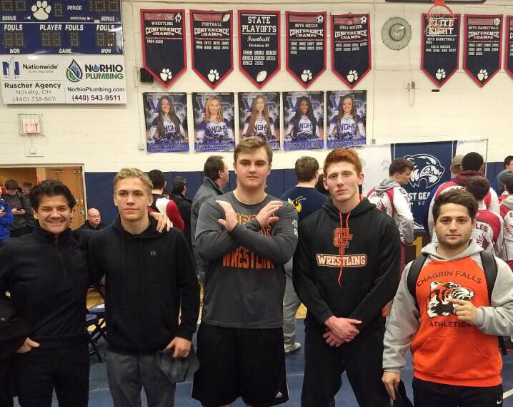 According to his fellow wrestlers, having Woofter as a teammate is fun, especially because he is a CVC champion, but more often than not, it’s what happens in between the matches and during practice that rubs off on teammates and coaches. Woofter has embodied Chagrin wrestling to the best of his ability and Coach Cimoroni sees it in Henry too. “Henry is a quiet and confident leader that does not boast but lets his success on the mat and in the room tell the story. We are big on getting the job done and letting others talk about how well we are doing,”Coach Cimoroni said. As the regular season comes to an end, the wrestling team will begin their postseason with some of the best fans cheering them on. “The team is a great group of young men and look for big things to come from this team in the weeks and years to come. I personally am very honored to coach such a fine group of young men and our assistant Coach Jake Goodwin has been tremendous in his technique and leadership with the entire team. The support from the family and friends of the wrestlers has been wonderful. To date we feel collectively this has been and will continue to be a successful season,” Cimoroni said. The boys wrestling team will be hosting senior night on February 7 at home honoring Woofter and fellow senior Jack Girard. Chagrin Falls Families are ready for the 2018 Holiday season! Students collaborate and win big at ideablitz!